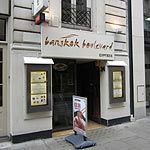 Bangkok Boulevard serves a wide range of authentic Thai dishes made on the premises with fresh ingredients. Do you work at Bangkok Boulevard? What did you think of Bangkok Boulevard?